Shown tonight, Saturday 11th July at 9:50 PM on Channel 5. Tonight [Spoiler]: Task results in some housemates winning back their suitcases. Harry and Sam's last day in the BB 2015 house. Harry voted out by the public. Housemates choose Sam to leave in Cash Bomb twist. •	Nick expresses concern over possible chanting in tonight’s eviction. •	Jack talks to Big Brother in the Diary Room and says that out of the Housemates up for eviction he would like to see Sam go. He calls her one dimensional and says that she has the least to offer. He also comments that he likes that Harry is so unpredictable. •	Joel goes into the bathroom where Nick and Harry are having a bath and asks to be the third wheel. •	In today’s task, the Housemates who lost their suitcases have a chance to win them back. Big Brother has decorated the Diary Room with hundreds of keys dangling from the ceiling and on the table are four boxes, each padlocked shut. Each box contains the name of a Housemate who is missing their suitcase. The key to each padlocked box is dangling amidst the many keys hanging from the ceiling. Big Brother calls each of the Housemates to the Diary Room and asks them general knowledge questions, every correct answer means a chance to find the key to a box. The task results in the Housemates opening 4 boxes and passing the task and winning back Cristian, Danny, Joel and Nick’s suitcases. •	One of the questions saw Danny asked to spell the word ‘canoe’, he fails and is mildly ribbed for this by Cristian. Danny does not take this in good humour and lashes out at Cristian. •	Cristian talks to Big Brother about who will leave the house in the pending eviction. He says that he thinks Sam is the most likely to go and expresses some annoyance at her catchphrases, especially hashtag tough crowd. He comments that ‘every crowd is a tough crowd when you say ***t like that’. •	After Harry’s eviction housemates are gathered again for the next Cash Bomb. Chloe, Jack and Sam are told to pick an envelope from the coffee table. Chloe is the first to open her envelope and read the amount to the Housemates, Chloe’s is £10k, next is Jack whose amount is 1k. 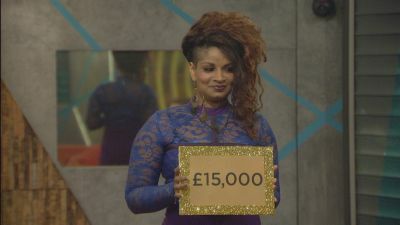 Lastly, Sam opens hers and reveals to the group her amount is £15k. Big Brother then reveals that the remaining Housemates must choose who to evict from Jack, Sam and Chloe. The amount on that Housemate’s head will then be added to the prize fund. •	Joel refuses to get involved on principle and turns to Danny and Cristian to make the decision and Danny decided on Sam and the rest of them quickly agree. Danny says sorry to Sam, who takes it well and leaves the house in good spirits. •	As soon as she leaves, the Housemates start to point fingers about who is responsible for Sam’s exit, Joel states very clearly he was not involved in the decision making process. •	Nick thanks Danny for ‘being a man’ and taking on the decision to evict Sam upon himself as Nick couldn’t. •	Cristian advises the Housemates not to respond to Joel when he is in this kind of argumentative mood. •	Danny goes to the Diary Room and says; ‘I’m a bit pissed off to be honest.’ He also says that he is disappointed in Joel and says that it was cowardly to cop out of the decision. •	The Housemates raise a glass to the departed Housemates. Nick makes a speech about Harry and Chloe about Sam. •	Nick says to Joel; ‘If we are finalists, it’s not what I wanted tonight to be like.’ He also admits that he misses Harry more than he thought he would but says; ‘I’ve got you though, you’re my best mate’. •	The Housemates start to cook a late night feast together, all finalists of Big Brother 2015.